How do I blacklist and manually exclude IPs through the ClickCease interface? This feature is part of the standard and premium packages only. 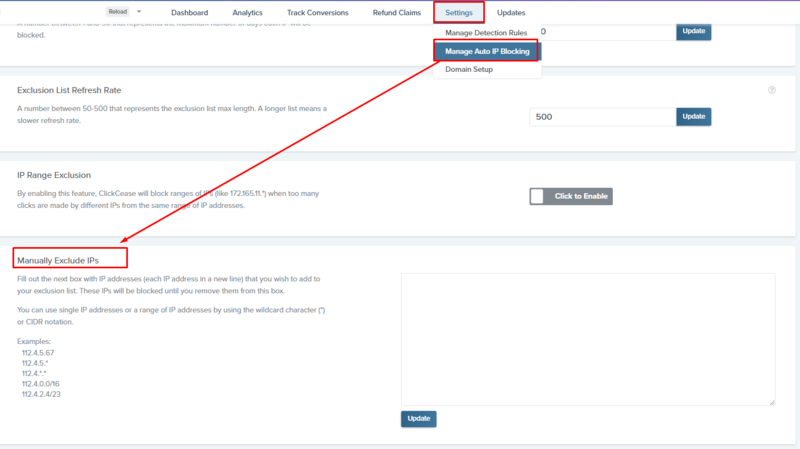 In order to add an IP manually across all of your campaigns' exclusion lists, all you have to do is enter your dashboard, head over to the "settings" tab and then refer to the "Manage auto-ip blocking" sub tab. Inside you will find a box called "Manually exclude IPs"; Any IPs added to this list will be added automatically by our system to all of your campaigns' exclusion lists. Important note: do not attempt to add IPs directly to your exclusion lists on Adwords since this action will conflict with our system and cause it to override the IPs you've added.